The hill country is in the centry of the island, or, to be more exact, in the southern half of the centre, the northern half being the plains of the so-called Cultural Triangle. The hill country is the reason for the biodiversity of the island, making it to one of the world's biological hotspots. The existence of mountains reaching heights up to 2,500 metres is, besides the winds itself of course, the main reason for the monsoon rain fall in the southwest of the island and for the dry climate in Sri Lanka's northern and eastern plains in the slipstream of the highlands. Most of the hill country belongs to the so-called intermediate zone, but this term is only referring to the annual rainfall. 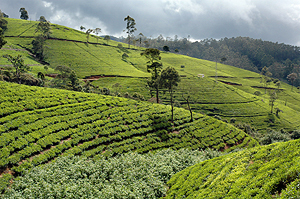 Indeed, the highlands are a separate third and completely different climate and vegetation zone of Sri Lanka, with mild or, sometimes at some places, cool temperatures and with a montane cloud forest of a unique flora and fauna. Most of Sri Lanka's hill country belongs to the Central Province, the capital of which is Kandy, situated in a valley about 700 metres above sea level. Kandy likes to be called the "hill capital". It is proud to have been the guardian of Sinhalese and Buddhist culture during the times of colonial rule along the coasts, where Christians destroyed temples and traditions. Kandy, protected by mountains, was never under full control of the Portuguese and Dutch colonial powers. Only the British managed to occupy it permanently, with the help of local noblemen and chieftains revolting against their king. However, The British remembers the old Sinhalese saying "No foreign forces will ever control Kandy, except they tunnel the mountains". So the British did, when constructing the main road from Colombo to Kandy, they tunneled, only for symbolic rasons, one rock at the Kadugannawa pass, which could easily be bypassed - and is so today. The natural and historical importance contribute to the touristic significance. Besides Kandy, the green tea plantation areas of Dimbula, Nuwara Eliya and Uva are main attraction for sightseeing tours in Sri Lanka's hill country. 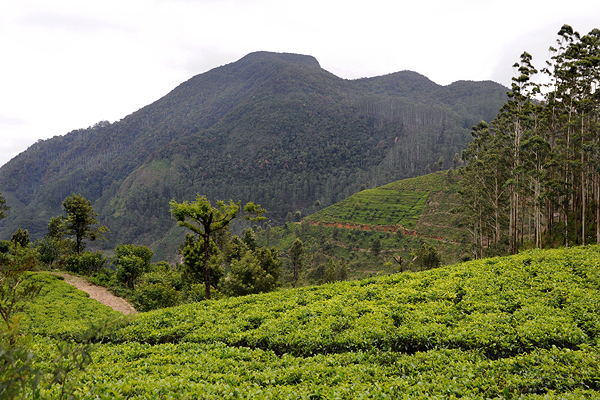 Though tea is grown in some parts of the lowlands, too, the best altitutes are above 1000 metres. 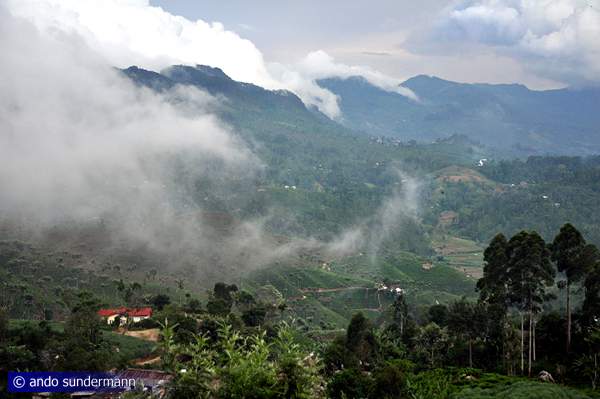 Ceylon tea and highlands are almost as synonymous as "Darjeeling" is both a mountanous region and a tea label. Some tea factories are open to the public, allowing visitors to study tea manufacturing processes. Tea cultivation is the reason why the highlands are not at all deserted. Surprisingly, the Central Province is the second most inhabited area of Sri Lanka, supassed only by Colombo and surroundings. The Nuwara Eliya District is home to a "second" Tamil minority of tea plantation workers, besides those Tamils traditionally living in the north and east of the island. Many Hindu temples can be seen around Nuwara Eliya, most of them are small-sized. However, the mountains are an attraction in itself, they offer unforgettable panoramic views and hiking or trekking in a pleasant or rustic surrounding. 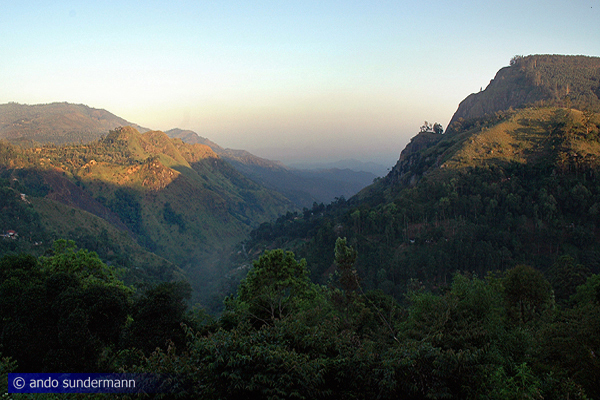 Many Sri Lankans love trekking or birdwatching or picknicking at waterfalls as a favourite weekend activity. That's the reason why many places in this otherwise rough and forbidding terrain are quite easily accessible, there are much more pathes and treks in Sri Lankas mountain region than in most other tropical countries. Particularly the northeastern and southwestern parts of the hill country, both together forming the UNESCO protected biosphere and World Heritage Site "Central Highlands of Sri Lanka", offer perfect trekking routes. These motane forest and trekking regions are Knuckles Range to the very northeast and Horton Plains and Peak Wilderness in the southwestern Maskeliya Range, the highest peak of which is the mythical Siri Pada, also called Adam's Peak, which was shrouded in legends circulating among seafarers from the Middleast and Europe and even China, because this most distinctive peak of Sri Lanka can sometimes be seen from the ocean, best weather conditions provided, and it was known to be the peak of the region where Sri Lanka's unsurpassed variety of gems and highest-quality sapphires coud and can be found. 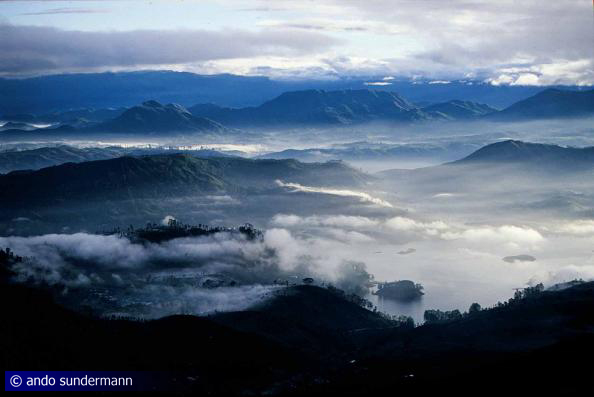 The two remaining forest-covered regions are separated by the central massif near Nuwara Eliya, reaching the highest elevations, and the surrounding tea growing areas already mentioned above and, last not least, the Mahaweli river valley. 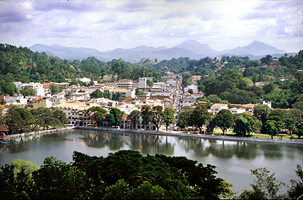 The Mahaweli is by far the largest river of the island, its first part crossing almost the full diameter of Sri Lanka's mountainous hill county. After inedependence from British rule, Sri Lanka developped several artificial catchment lakes for irrigation and power supply, the entire scheme called the "Mahaweli project". 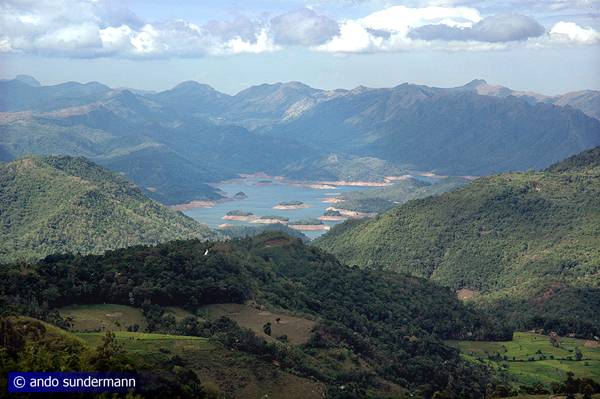 Not undisputed, because damaging natural environments and resettling people, the Mahaweli reservoirs are nevertheless another pleasant sight in this wonderful region. The following list only mentions a few examples of mountains, those of particular interest for travellers. Adam's Peak is a prominent conical mountain of 2,243 m height at the southwestern edge of Sri Lanka's highlands. The spectacular mountain is called “Siri Pada” by locals, holy foot”. Buddhists believe a depression in the rock on the very summit to be a giant footprint left by the Buddha when he visited the island. Siri Pada is one of the major pilgrimage sites in Sri Lanka, interestingly not only for Buddhists. Hindus venerate the footprint as set by Shiva. And many Muslims think that it was left by Adam, the first human being. After Adam had to leave paradise, he set his very first step on this peak. Definitely, the summit this is the place on earth closest to paradise. Doubtlessly, those climbing one of the two long stairways to the top, will agree to this Muslim version when enjoying the breathtaking 360-degree panorama. Good luck provided, they can also see the triangle shaped shadow of the mountain after sunrise. "straw plateau rock". Though reaching the total height of 2,524 m (8,281 ft) above sea level, Pidurutalagala is not a peak as spectacular as Siri Pada, because it's less steep and the surrounding valleys are themselves about 2000 metres high already. 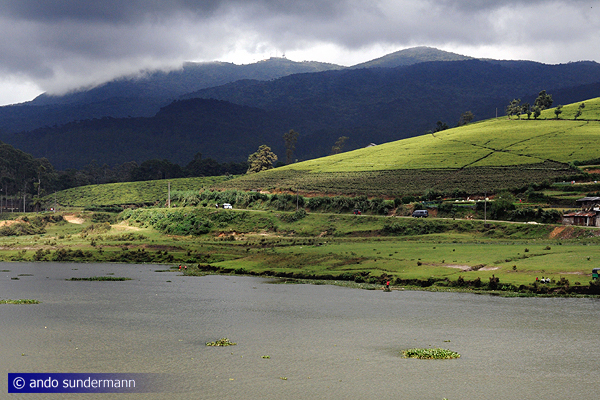 Pidurutalagala is located close to Nuwara Eliya, the highest situated city of Sri Lanka. Regrettably, the island's highest summit van ot be climbed any more, since a central communications array of the government and a radar of the armed forces of Sri Lanka are placed on the very top. You can only walk to the first checkpoint, but then you must have a vehicle to take you the rest and cannot go to the highest point. "World's End" is the name of two precipices at the edge where Sri Lanka's highest plateau, Horton Plains, ends abruptly at vertical cliffs of up to 600 m height. Horton Plains, also called "Maha Eliya", meaning "Great Clearing", is situated about 2000 m above sea level, on average. Horton Plains is the island nation's only national park where hiking and trekking without a ranger is permitted. The most frequented trekking root, taking about three or four hours, starts at the main car park in the centre of the national park, crosses Baker's Falls and finally reaches the two panoramic view points called "Littel World's End" and "Big World's End". (There is also a "Mini World's End" in Sri Lanka, really, not less spectacular, but 100 km away from Horton Plains). 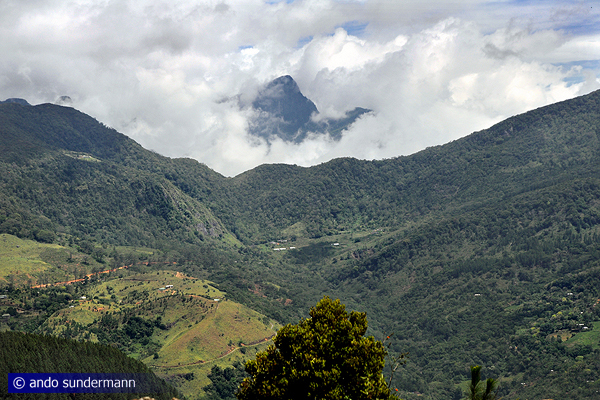 Clouds from the lowlands usually reach the Horton Plains plateau about 10.00 am. Thus it's highly recommendable to start the hike to World's End in the very early morning. 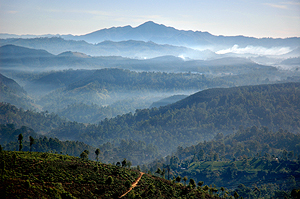 Knuckles Range is the northeastern part of Sri Lanka's hill country. The Sinhalese name for this massif is "Dumbara Kanduvetiya", "foggy highland". Knuckles Range is, besides Horton Plains and Peak Wildernesss, another part of the UNESCO protected biosphere and World Heritage Site "Central Highlands of Sri Lanka". At higher elevations, there are isolated cloud forests, which are protected for their biodiversity. They are home to many endemic species, too. 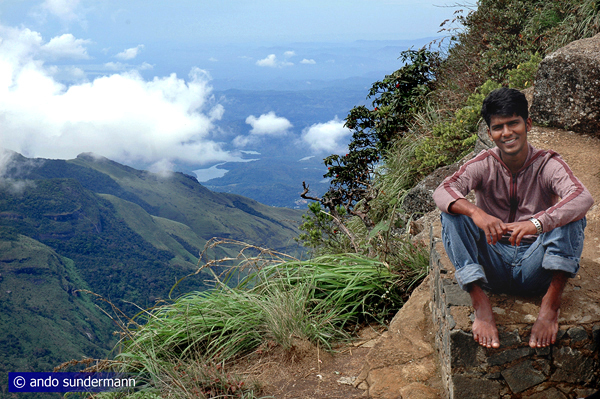 For eco-tourism, Knuckles Range is the best trekking area in Sri Lanka. There are a few one-day-tracks up and down from Meemure and other villages, but you need two or three days to cross the Knuckles Range from north to south, then usually starting in Riverston. Some smaller hikes can be done, tooOne of the most fascinating panoramas of the island, called "Mini World's End", can be reached within only half an hour from Deanston.